Looking for Water Slides and Splashtastic Fun? The summer heat in Indiana can be mighty oppressive. Nothing quite brings relief form soaring temperatures than jumping into some refreshing water. One of the most fun ways to beat the heat? Visiting a water park. But water slides and lazy rivers are no longer just a summer thing. The state boasts a few indoor water parks that are climate-controlled and weatherproof. Even when the cornfields are filled with snow, folks can get into their bathing suits and hit the water. Let's review Indiana's water parks, which are arranged alphabetically. The medium-sized park offers a bowl ride, body slides, a tube slide, a lazy river, an activity pool with water basketball, and a lily pad walk. Perhaps best of all, it features a retractable glass roof that allows sunlight in year-round and opens in the summer. Big Splash is open to registered hotel guests and to the general public. During the summer, guests can frolic in the park’s outdoor pool. The onsite hotel offers 150 rooms and suites. Nearby attractions include the French Lick Resort and Casino, Shotz Miniature Golf and Lazer Tag, and Wilstem, which features ziplines, ATV tours, horseback riding, and elephant encounters. Note that Caribbean Cove closed in 2018. 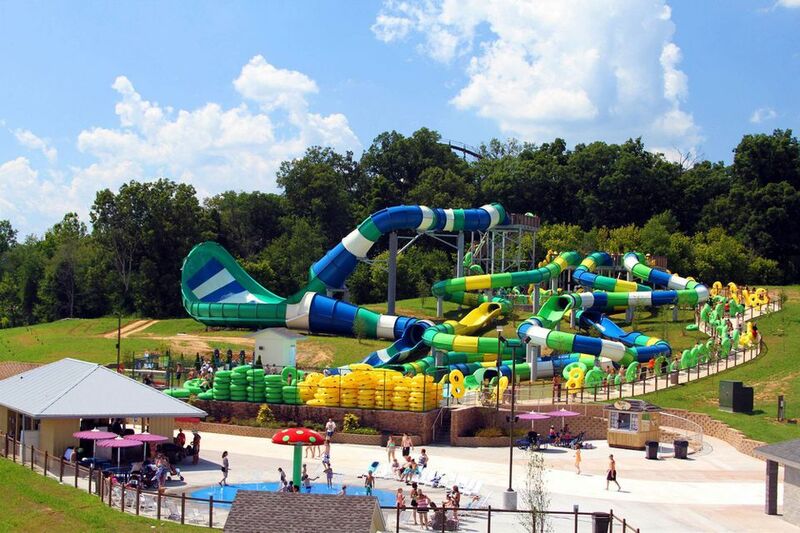 The good-sized park offers plenty of attractions including a wave pool, body and tube slides, a lazy river, the "Water Wars" interactive challenge arena, and the Double Dueling Cannon Bowl Ride. There is also beach volleyball, multiple food stands, and a play zone for younger visitors. In the winter offseason from late November through late February, Deep River offers ice skating. During the winter, the park still offers food and keeps its birthday party room available. A small municipal water park, Freedom Springs offers water slides, a lazy river, and a splash pad play area. The park is open Memorial Day through Labor Day. In addition to the water park attractions, the park department offers swim lessons at the facility. Freedom Springs can be rented for private events. The water park is relatively small, but it is part of Indiana Beach amusement park, and is included with admission. As its name implies, there is a sand beach and swimming area. Water park attractions include water slides, a lazy river, and the Splash Bash interactive water play zone. Rides at the amusement park include the Cornball Express and Hoosier Hurricane wooden coasters, the Steel Hawg steel coaster with a 111-degree first drop, the Double Shot drop tower, and the Den of Lost Thieves dark ride. Visitors can take a leisurely ride aboard the Shafer Queen paddlewheel boat. The resort offers hotels, cottages, cabins, camping sites, and other accommodations. The small municipal water park, part of Kokomo’s Parks and Recreation Department, offers body slides, tube slides, a lazy river, a leisure pool, a splash pad play area, and a kiddie slide. A lap pool is available in addition to the water park attractions. Originally a “swimmin’ hole,” Pine Lake dates back to the early 1900s. It now offers modern water park attractions such as water slides and an interactive water play structure. The slides empty directly into the lake. A small, municipal facility, River Run offers water slides, a bowl ride, and activities for children. In addition to water park attractions, swimming lessons, lap swimming, and water walking is available. The medium-sized park features water slides, a wave pool, “spraygrounds” for younger children, beach volleyball, an indoor playground, and an arcade. The season generally starts Memorial Day weekend and ends on Labor Day. Visitors cannot bring their own food or drinks into the park. A small municipal facility, Splash Island offers water slides, a lazy river, a lily pad crossing, water basketball, a kiddie pool, and a water play structure. It is operated by Plainfield’s parks and recreation department. The enormous water park (one of the country's biggest and best that is connected to a theme park) offers an incredible array of attractions including record-breaking water coasters, a funnel ride, a mat racing slide, two wave pools, and a family raft ride. Splashin' Safari is included with admission to the theme park, Holiday World. The water park is so huge, it would be difficult to enjoy all of its attractions in a single day. Considering that Holiday World also offers incredible coasters, visits with Santa Claus, and all kinds of other wonderful things to do, a 2-day visit would make more sense if you would want to try and experience it all. The family that operates Holiday World also runs the nearby Lake Rudolph Campground. There are other places to stay in Santa Claus as well. A small municipal facility, Tropicanoe Cove has a pool, a lazy river, body and tube slides, and an interactive water play area. It is generally open from late May through Labor Day. Season passes are available.